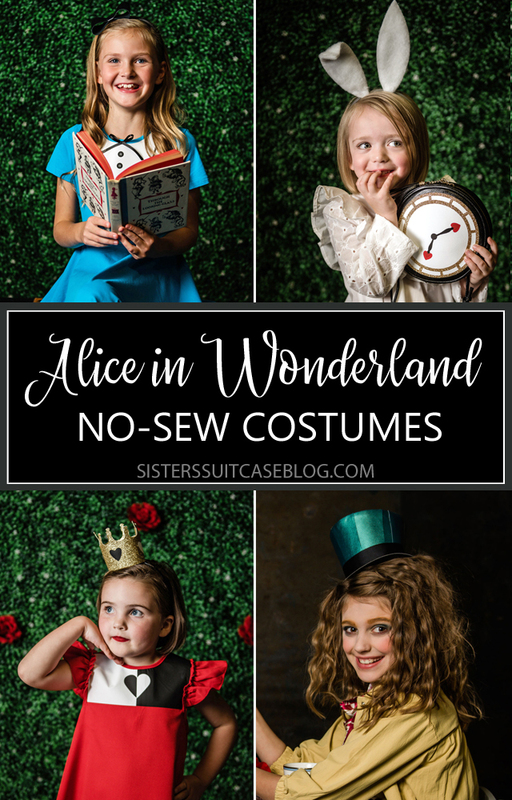 DIY these No-Sew Alice in Wonderland costumes using basic dresses and embellishments created with the Cricut Maker! 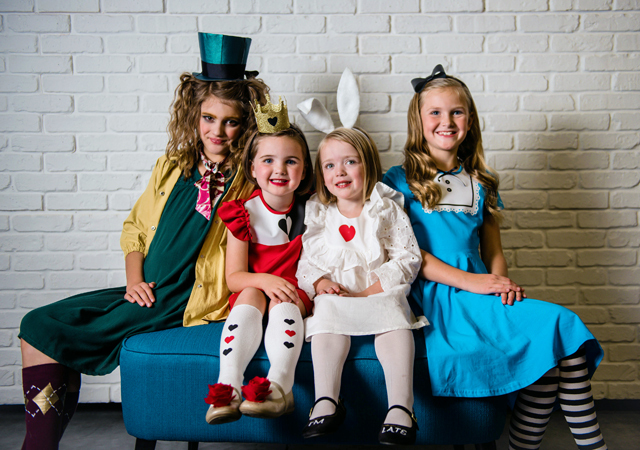 This set of classic Disney group Halloween costumes includes Alice, the White Rabbit, Queen of Hearts and the Mad Hatter. 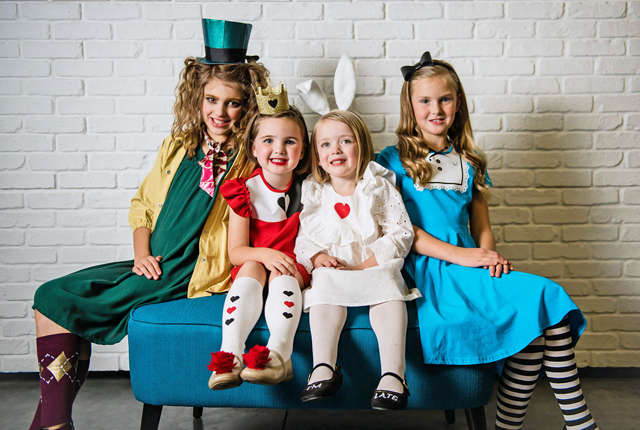 These handmade Alice in Wonderland costumes for kids are sure to be the hit of any Halloween party! Start with a basic, comfortable, dress. We have all worn itchy costumes and it is the worst! 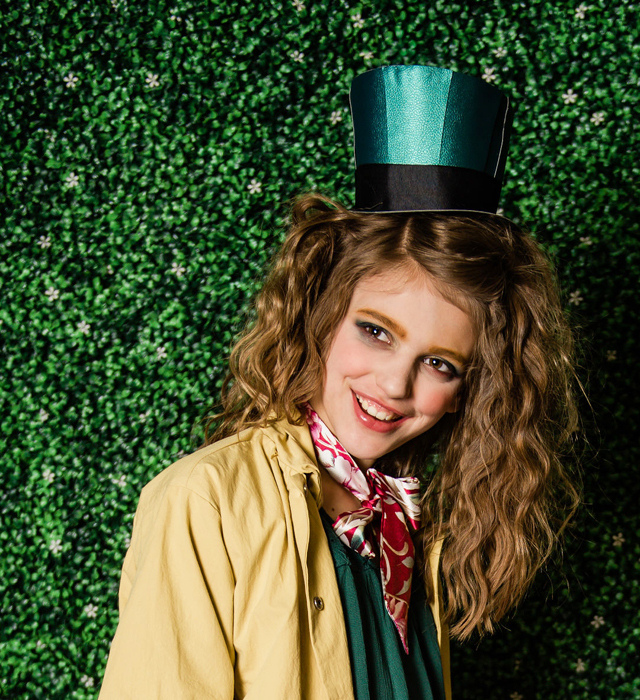 Start out with a comfy, washable base for your costume and it will last for years. 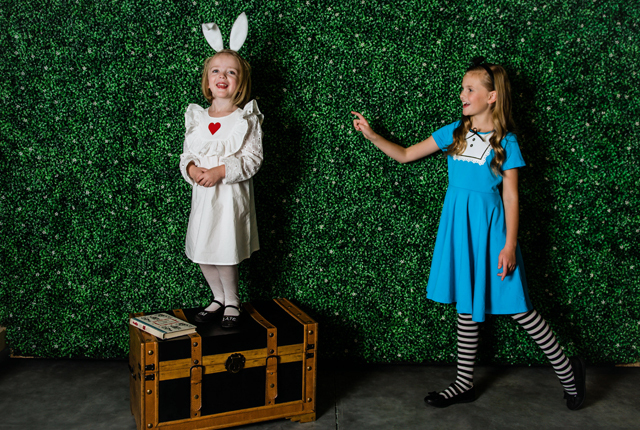 We found this beautiful blue knit dress for less than $20, and it makes the perfect Alice costume. 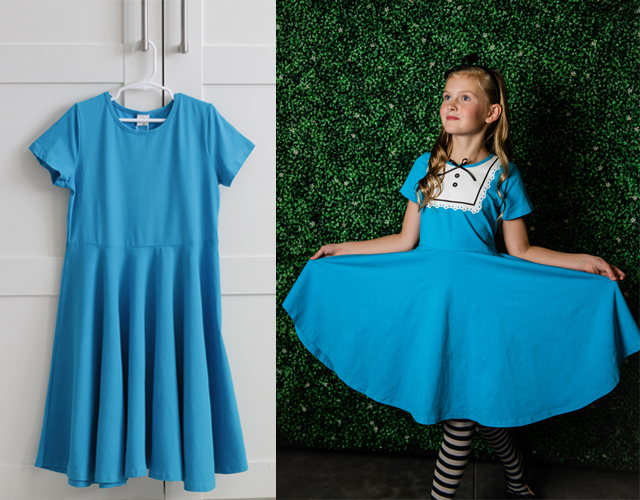 It comes in lots of different colors, so you could use this dress for almost any little girl’s costume you want to DIY. Just add vinyl. 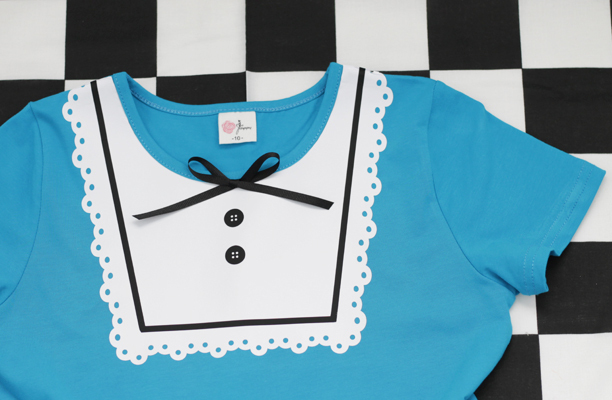 We created a simple lace collar design that gives a nod to the classic Alice dress, and we achieved the entire look with Everyday Iron-On vinyl and our Cricut Maker! Create your own accessories. The little details in a costume can make the biggest difference! 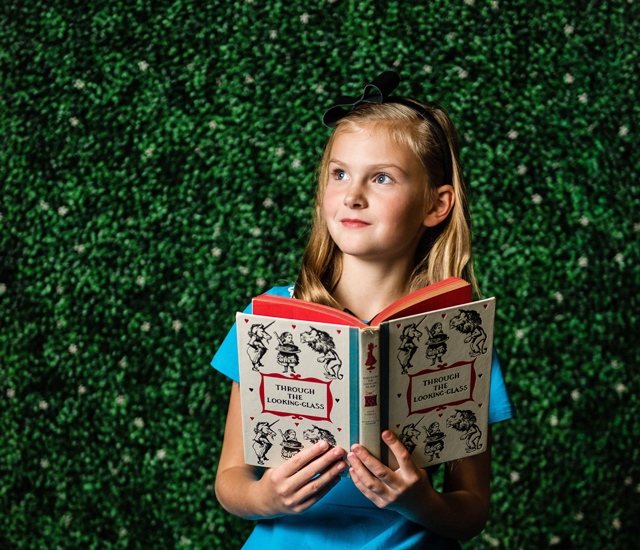 For each of our Alice in Wonderland costumes, we made a special headpiece using the Cricut Maker. 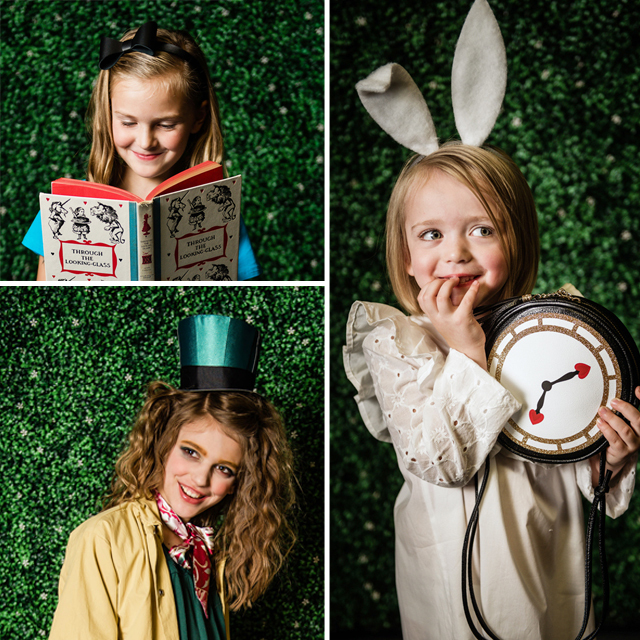 A genuine leather black bow headband for Alice, fuzzy felt rabbit ears for the White Rabbit, a crown for the Queen of Hearts, and of course, the Mad Hatter’s glorious hat! Complete the look with items you have at home. You don’t have to spend a fortune to make your own Halloween costumes. 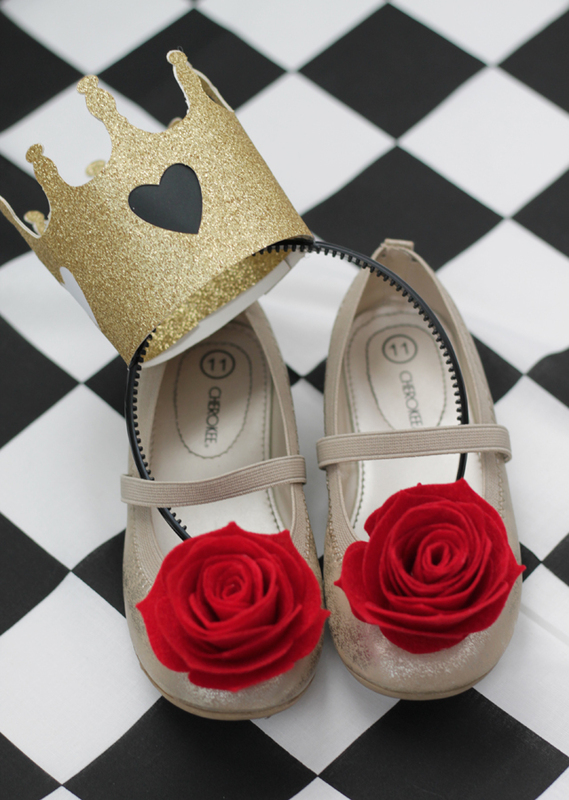 We used shoes our girls already had in their closets and updated them with projects using the Cricut Maker – the perfect finishing touch for their costumes! Having a variety of options at our fingertips with our Cricut Maker really opened up the world of possibilities with these costumes! We were able to think outside the box, and then execute on our creative ideas! It was so much fun to learn more about the amazing things our Maker can do. One of the most impressive features of the Maker is the suite of tools available. The new advanced rotary blade can cut through virtually any fabric or material, and the Adaptive Tool System, including the knife blade and scoring wheel, gives us professional results in a huge variety of projects! 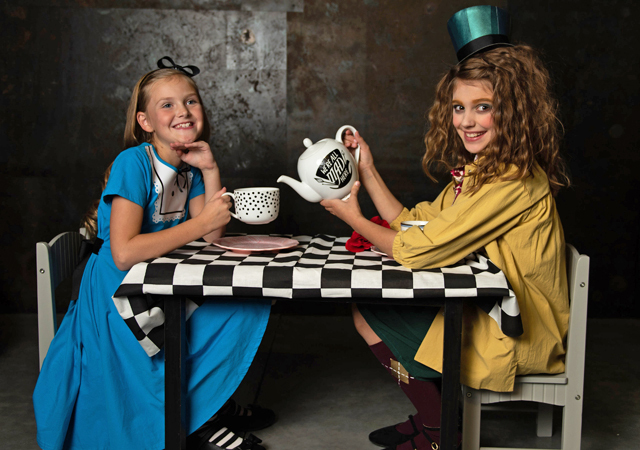 We can’t wait to share with you how we put together each of these Alice in Wonderland costumes! We started with this adorable red sheath dress from Shein. 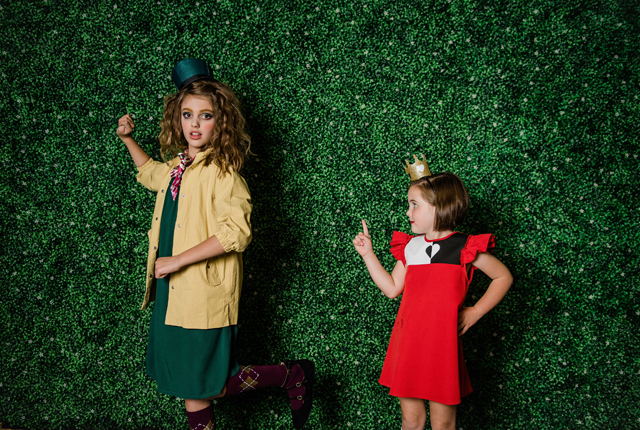 They have some great deals online for girls dresses, and we got a few of our main costume items there. 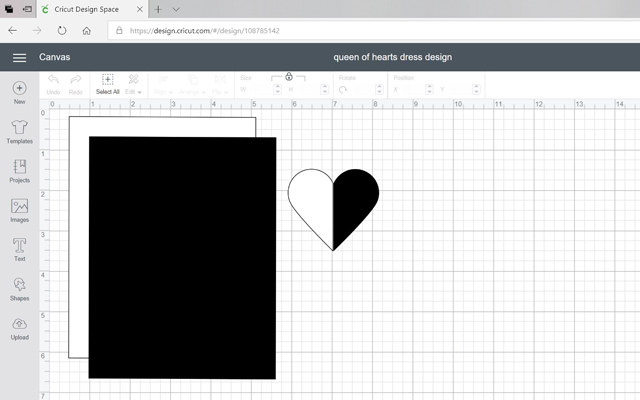 Next, you can use our Queen of Hearts file in Cricut Design Space to create the black and white color block design. 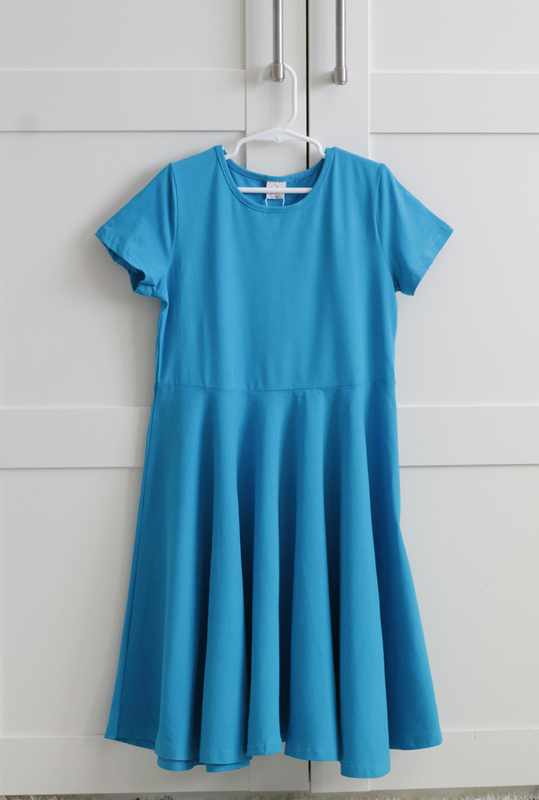 It is currently sized to fit this 5T dress, but you can easily resize it in Design Space to fit your needs. 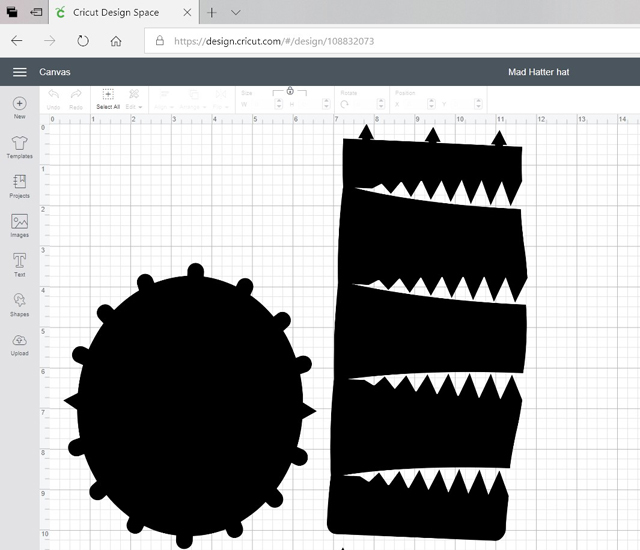 Cut out the 4 pieces of the design (2 white and 2 black) in Everyday Iron-On Cricut vinyl. Place your designs on top of the dress to make sure they are the right size and adjust if necessary. 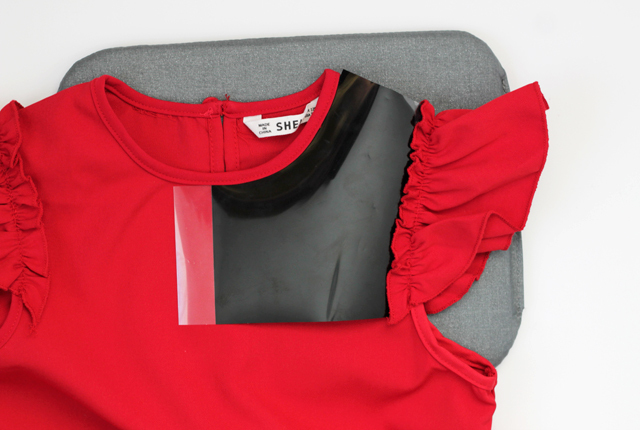 Before you iron on the designs, you’ll need to hand cut the neckline… this is the only tricky part of this design, to get the neckline to match perfectly with your dress or shirt. In order to get it right, we used a PAPER pattern. So after you cut out your vinyl, use the same file and cut the rectangle designs out of whatever paper or cardstock you have on hand. 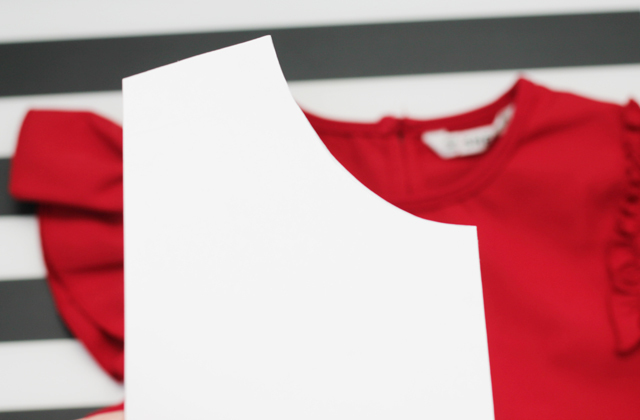 Lay the rectangular paper piece over the dress and line it up on the sides and bottom correctly. 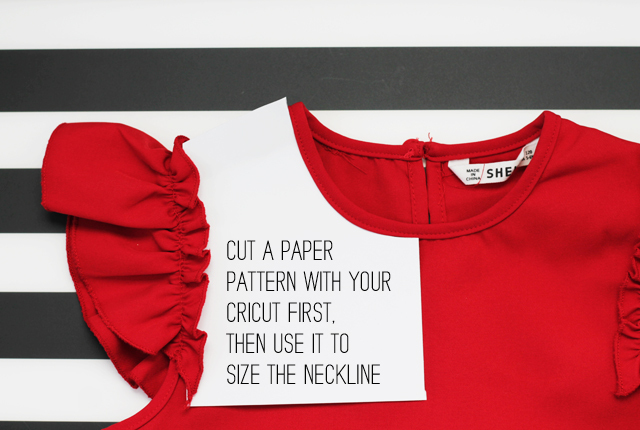 Then take a pencil and carefully draw a line along the neckline of your dress. Cut along the line and give yourself a little extra space so you can trim if needed. It might take a few trial and errors to get it perfect! Now you are ready to iron each piece on to the dress! I did one half at a time, so I could line up the pieces perfectly. I used my EasyPress 2, in the 6″x7″ size, and my EasyPress 2 mat. Once I had the black side ironed on, I covered it with the cover sheet again, and a pillowcase to protect it from the heat. The nice thing about the smaller EasyPress, is that you can apply heat to a certain section of your project without reheating the vinyl you’ve already applied. *For more information about the EasyPress 2, and why I’m obsessed with it, go here. 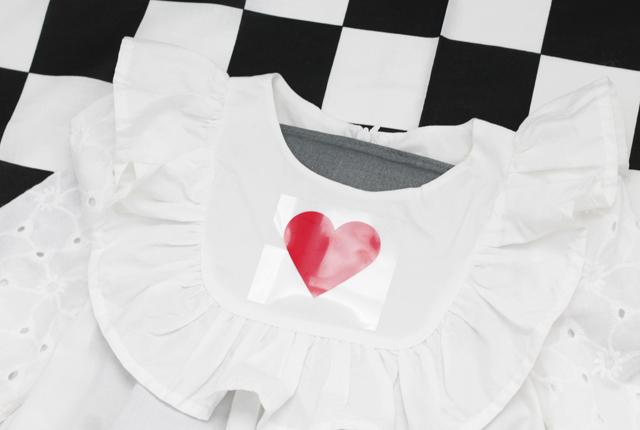 Once the white side is ironed on, the last step is to add the black and white half heart shapes. Make sure you line them up really straight on the center line where the white and black vinyl meet! Again, cover the first layers of vinyl before you iron on the hearts. 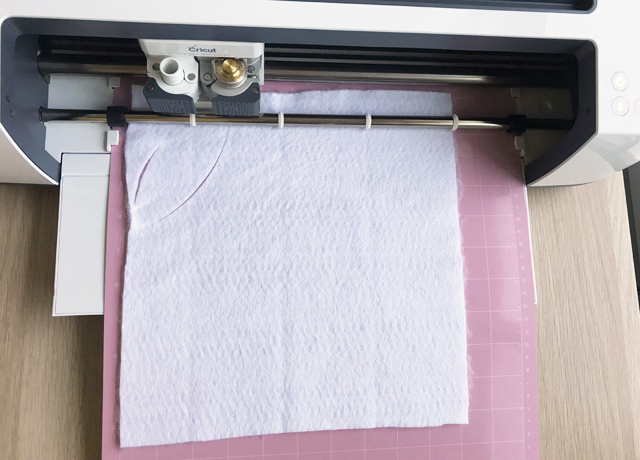 You won’t want to use as much time on this second layer, (reduce by about 5 seconds), to avoid wrinkling of the first layers. Always check the EasyPress Interactive Heat Settings guide for the recommended times and settings for the materials you are using! I’m so happy with the final result! 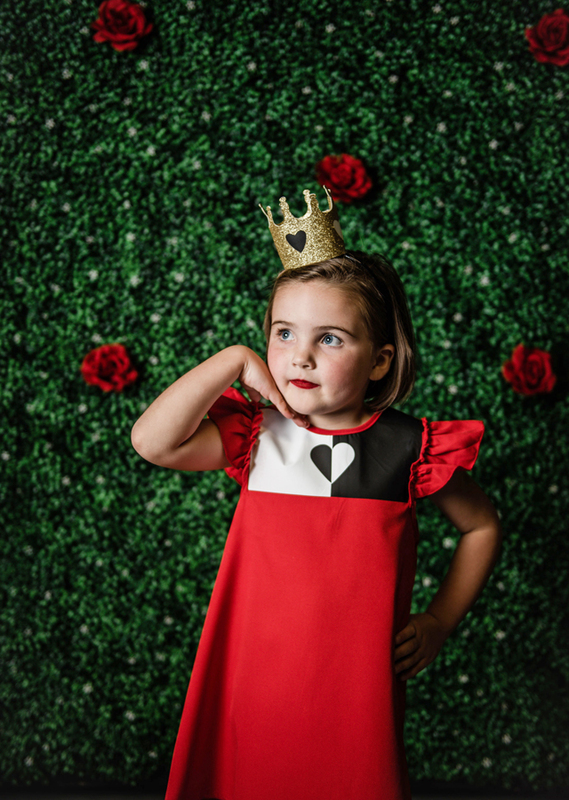 This little crown project is one of my favorites because it is really simple and you could modify it for so many different costumes or occasions! Princess, birthday girl, mermaid, the possibilities are endless. 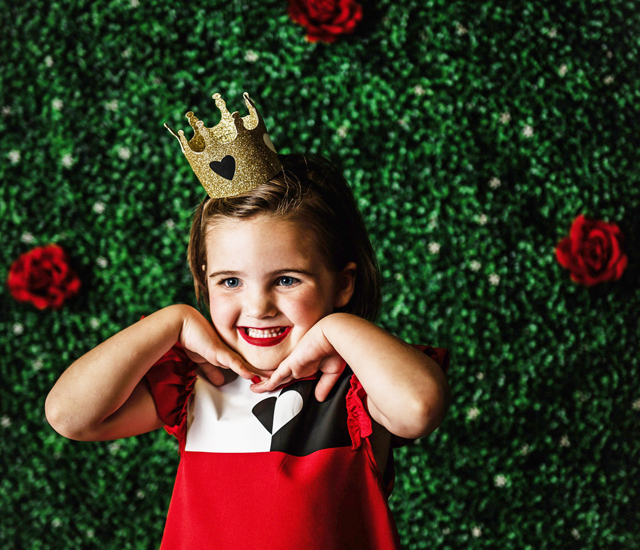 We decided to make our Queen of Hearts crown out of regular glitter cardstock because we wanted a little bling and shine! But it would be so fun to make this same crown out of felt (using the rotary blade) or even leather (knife blade)! 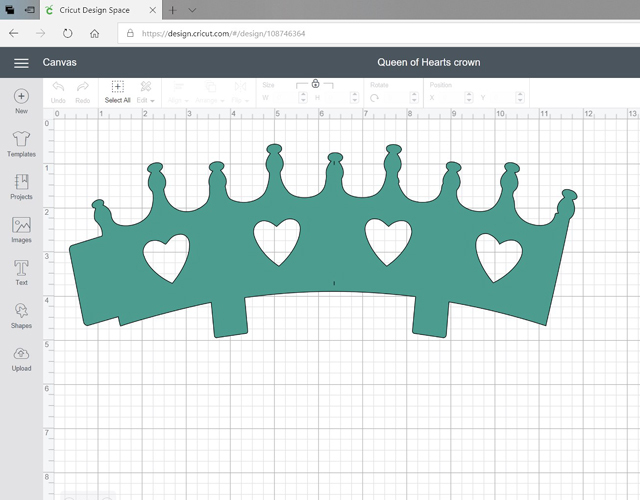 Click here for the Heart Crown design file I used in Cricut Design Space. I didn’t modify it at all, other than just sizing it for my daughter’s head. I did end up cutting two of the crowns, one regular, and one mirrored so I could line the inside of the crown at the top because the white showing through was bothering me! 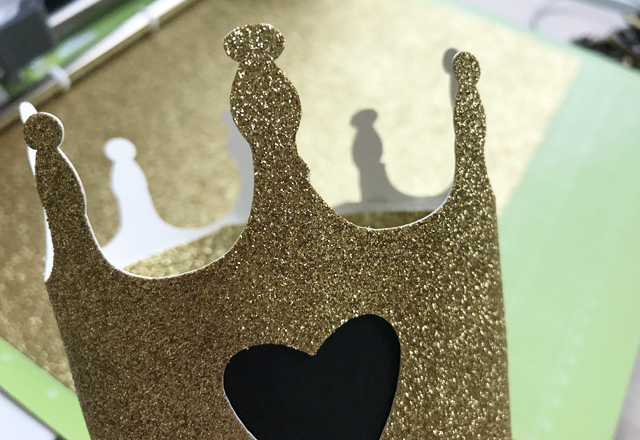 I just used hot glue to attach the inner layer, but in order to get the points of the crown to match up exactly, I had to cut the inner layer into a few sections as I glued them. I also added small squares of black and white cardstock behind the cutouts of the hearts. This crown was fairly simple to put together with hot glue! Once it was done, I just hot glued the base of the crown to a simple plastic headband. 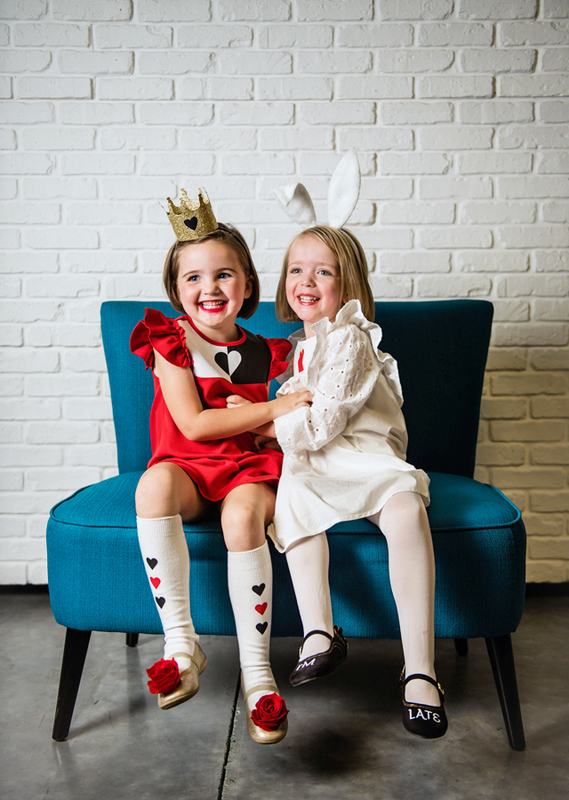 The final accessory we made for the queen of hearts are her custom knee high socks! The tutorial for these heart socks and adorable red rose shoes is coming soon! 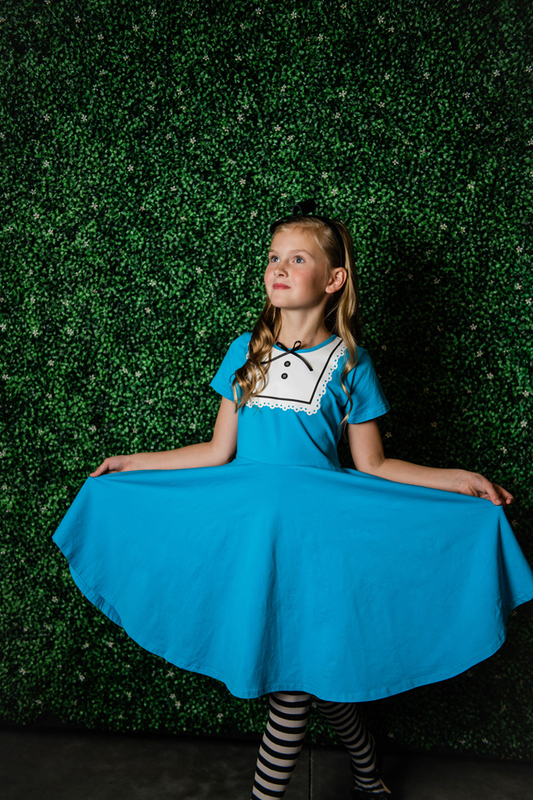 We started with a basic blue dress and created a classic Alice costume using Iron-on vinyl. I love this one so much because it shows how a simple iron-on design can have such a big impact on an entire look! 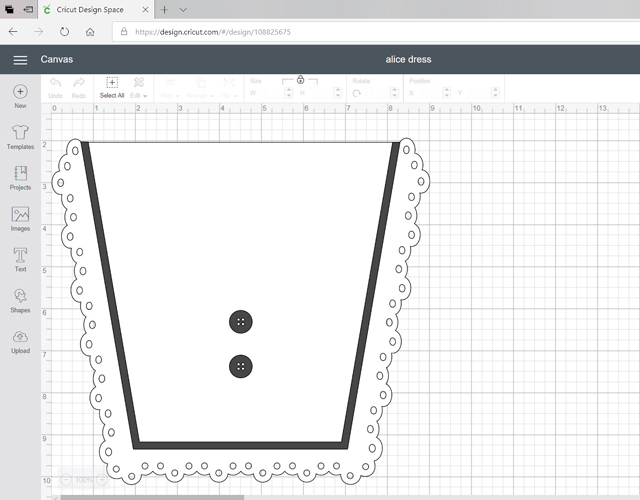 First, we had to create this lace collar and button design in Cricut Design Space, and you can access it here Alice Dress design. We made it easier to layer the design by attaching the colors together in the design. So you just have to make one cut for the white iron-on vinyl, and one cut for the black parts of the design. 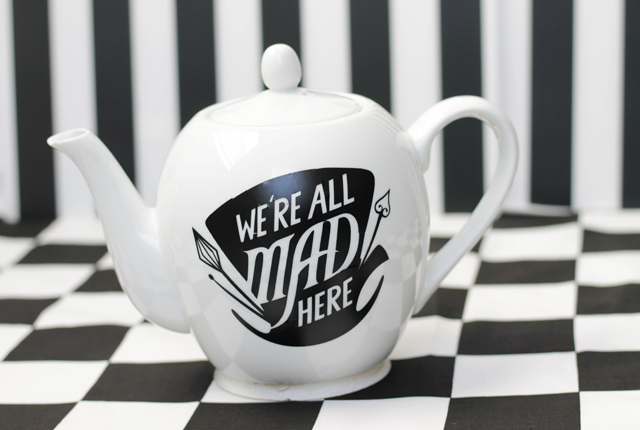 Make sure you mirror the designs, just like any other iron-on vinyl project! 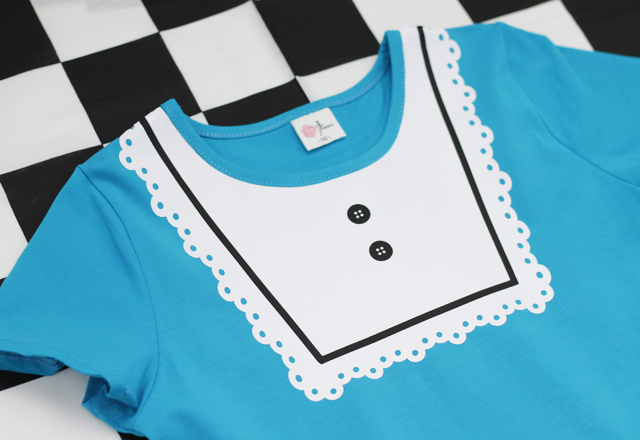 We used Cricut Everyday Iron-on vinyl with the Strongbond guarantee because we want this costume to be super durable and washable. 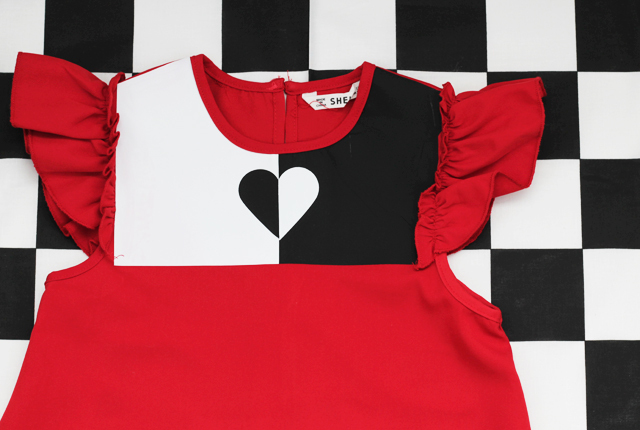 We also used the paper template technique (for details, refer to the queen of hearts tutorial above) to cut out the neckline. Ironing on the collar design was easy as can be with our EasyPress 2, 9×9″ size. The dress is a cotton/poly blend so we set the temperature to 315 degrees for 30 seconds, then pressed the design with gentle pressure. We used the same settings for the top black layer, but reduced the time to 25 seconds. Then I pressed the back of the dress for 15 seconds to seal the design. I can’t believe how great it came out! This is the only place where I had to cheat the “No-sew” a little! 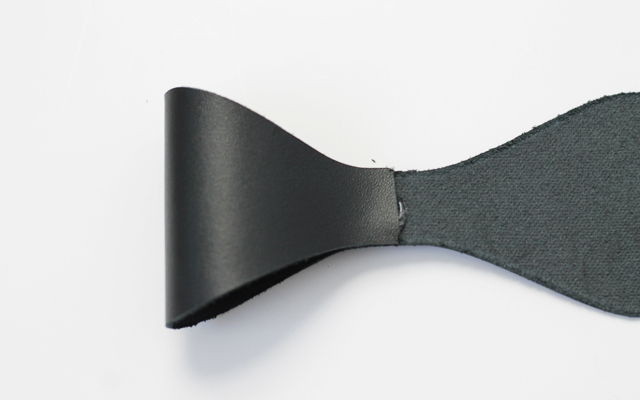 I tied a small black bow with grograin ribbon and used a needle and thread to tack the ribbon in place in the center of the collar. Just a few stitches and it is completely secure. I’m so in love with this dress! 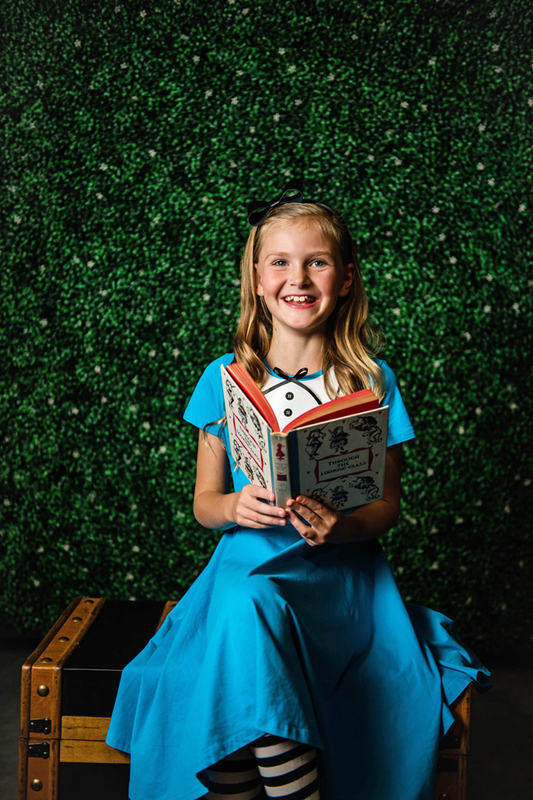 We completed the look with some black and white striped tights, simple mary jane shoes, and a handmade black leather bow headband. I was really excited, and a little nervous, to make this leather bow headband for Alice because I’d never used the knife blade on my Maker. Now that I’ve done it, I can honestly say it was super easy! 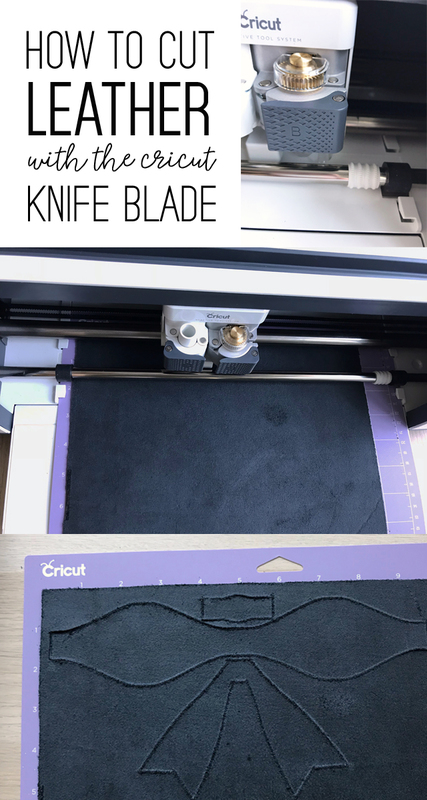 But for those of you who still haven’t tried it, I want to share a few tips for using your knife blade and cutting leather for the first time. The genuine leather is so pretty! I was really impressed with the quality and texture of the Cricut leather. 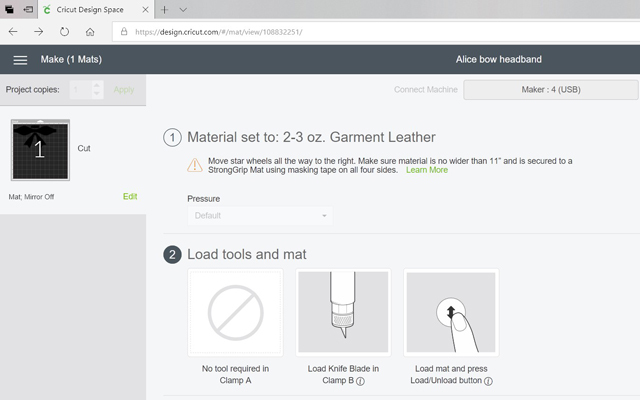 Once you have calibrated your machine with the knife blade in, (you only need to do that the first time you use your knife blade), you’re ready to cut the Alice bow design, which I found in Design Space. When you set your material to Genuine Leather, it should prompt you to use the knife blade. If it doesn’t, you can change the material to garment leather 2-3 oz. and it will cut beautifully. The screen will prompt you to do a few important things… first, to move the white star wheels all the way to the right side of your machine. That is important so the wheels don’t leave marks on the leather as it’s cutting. 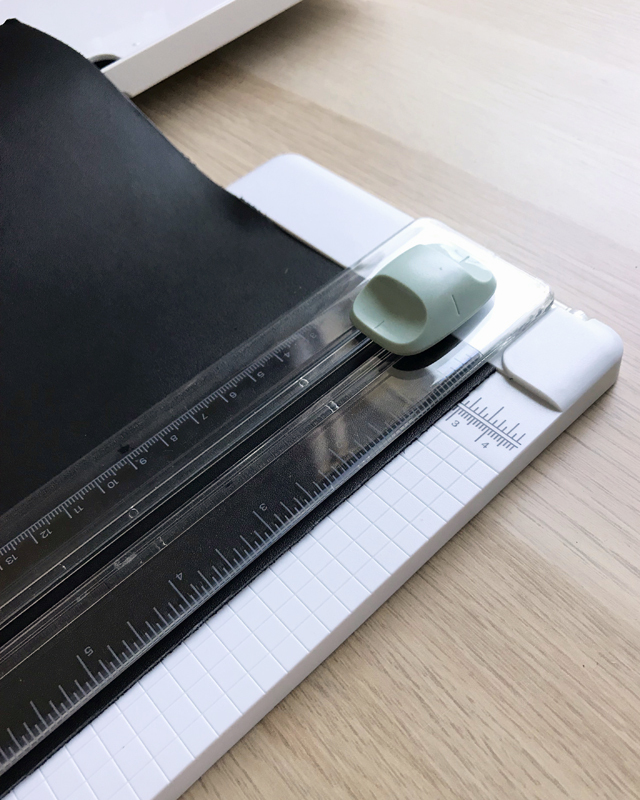 Next, it tells you to make sure your material is no wider than 11″, so you will need to trim the leather sheet down to 11×12″. 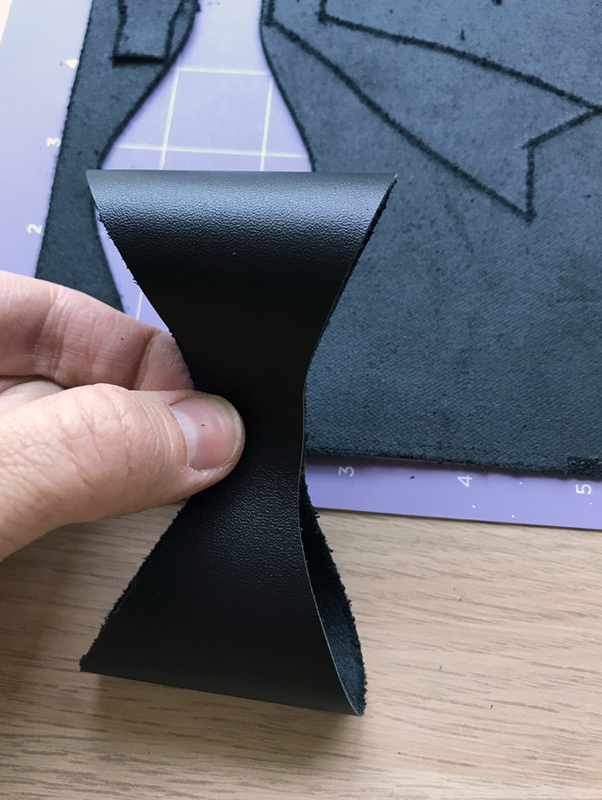 Now, you just have to attach the leather to a Strong grip mat and make sure to put the smooth side of the leather face down on the mat. Double check that it has cut all the way through before you completely remove the mat from the machine. Mine cut perfectly on the first try! Use hot glue (on high temp setting) to attach the bow and secure it together. 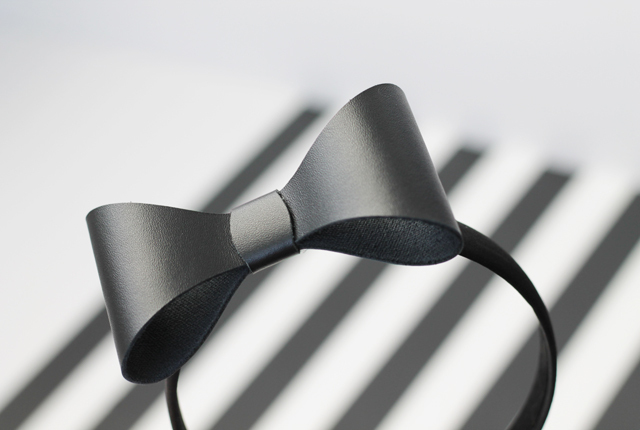 Hot glue the finished leather bow to a wide black headband, I got mine from the craft store. 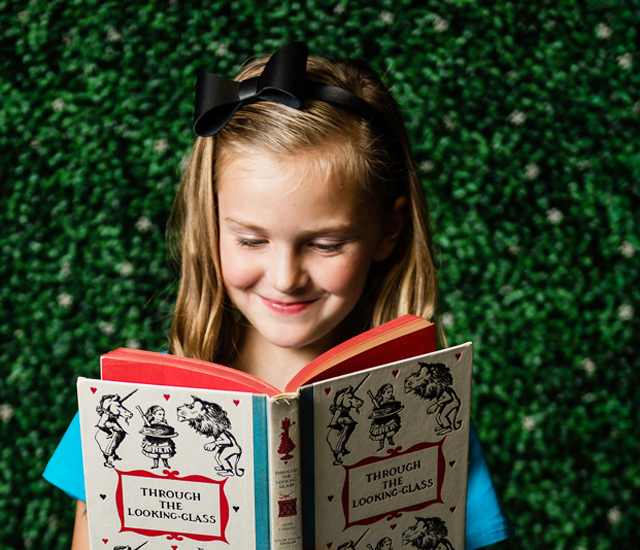 It’s the perfect finishing touch to Alice’s costume! 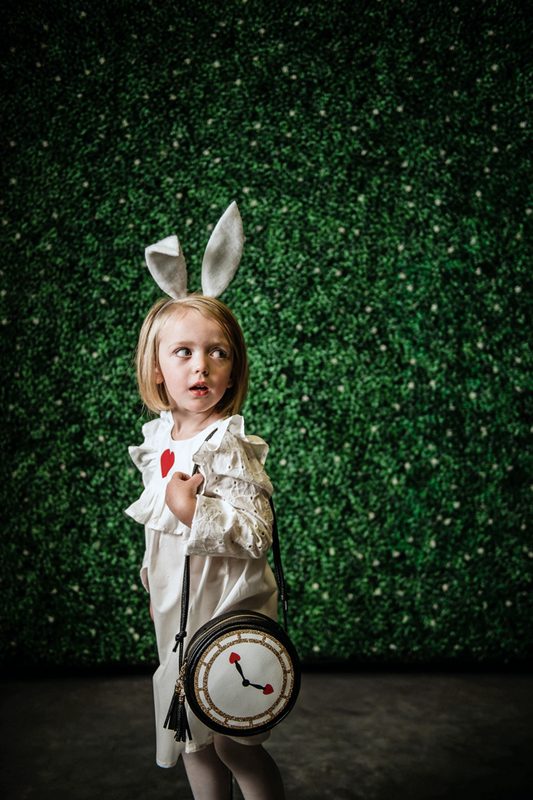 We wanted to make sure our White Rabbit costume was a modern and adorable take on the traditional character. 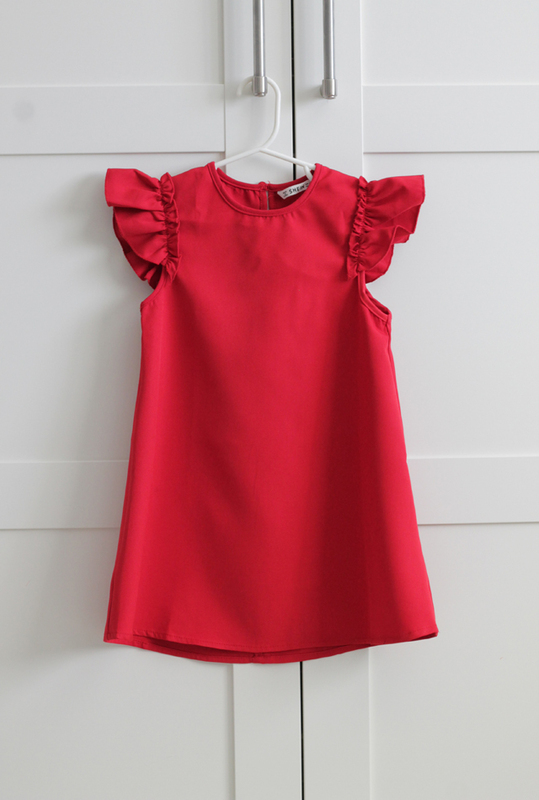 This darling cotton dress with a playful ruffle and eyelet sleeves was a perfect fit – and it was comfy for our littlest member of the group! 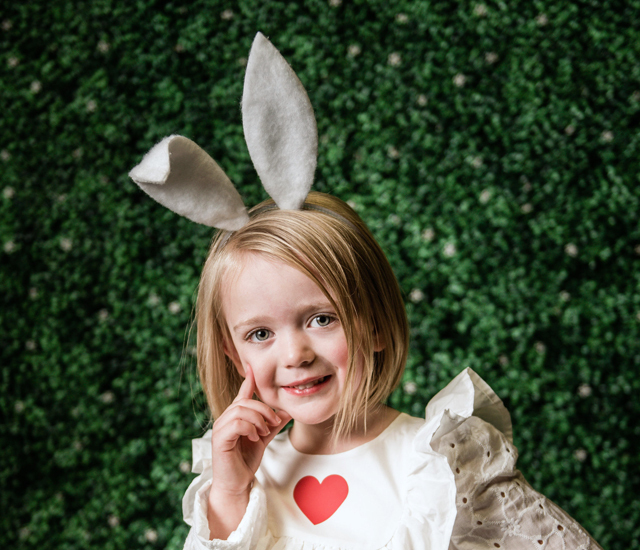 The White Rabbit costume has some really special accessories, so we kept the actual dress simple with a single red heart! 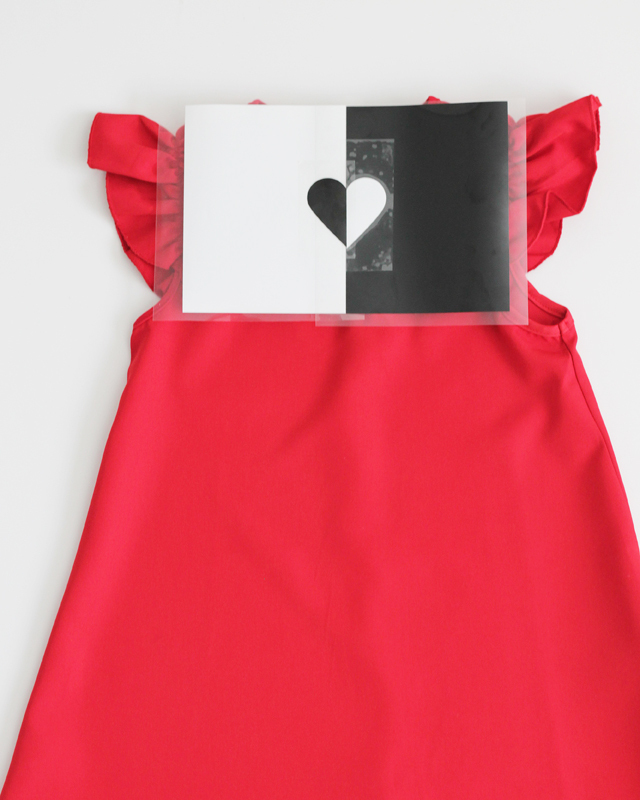 After cutting the heart from red Everyday Iron-On, we used the 6×7″ Easy Press 2 again to adhere it to the top of the dress. 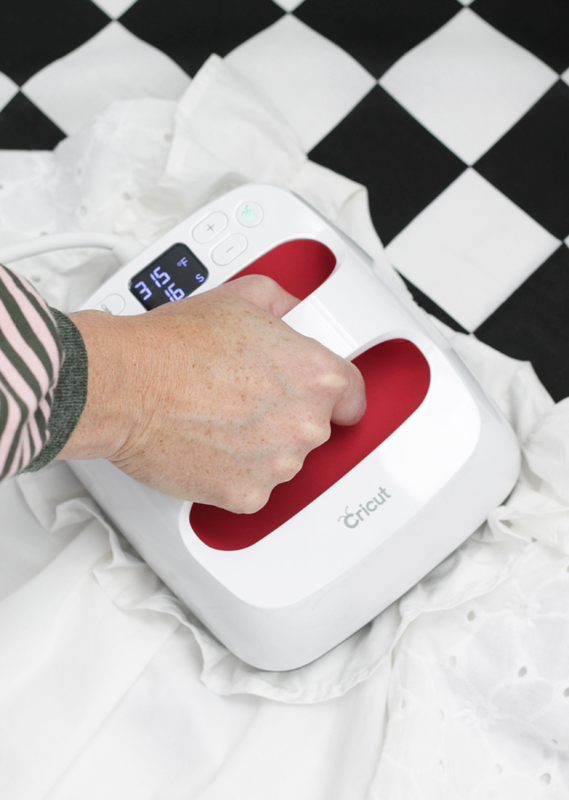 This white dress is 100% cotton, so we set our EasyPress to 315 degrees and set the time to 30 seconds. Always check the EasyPress settings on this quick reference guide HERE for your specific material before pressing! Normally if I wanted to make a pair of ears like this, I would have to draw (actually no, that would be a disaster in my case) or print out a pattern, cut it out, pin it to the fabric and cut 4 identical pieces with fabric scissors that I hope my kids haven’t ruined yet! Using the Maker saved us a lot of time and hassle on these ears. In less than 5 minutes, I had the ears sized and ready in Design Space and cut! 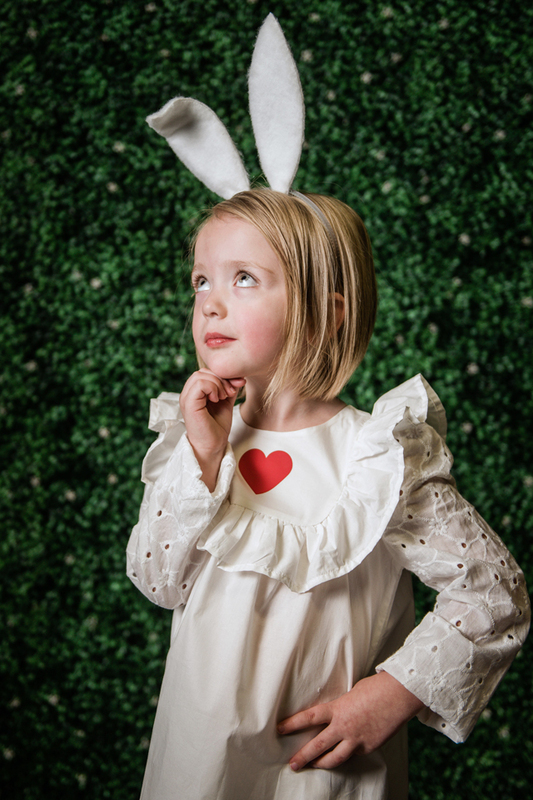 Click here to access our White Rabbit Ears file in Cricut Design Space. The rotary blade is seriously amazing. It had no problem cutting through the felt. To give the ears more structure, I added white pipe cleaners in a smaller ear-shape between the two layers of felt and glued along the edges. Then I used hot glue to attach each ear to a plastic headband. Such a simple project! And super quick thanks to the rotary blade! 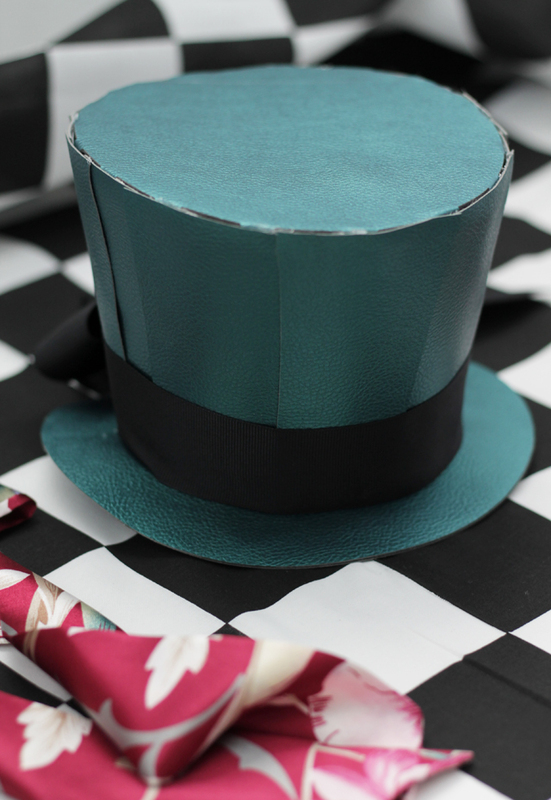 The one project I was a little bit nervous about was making a statement hat for the Mad Hatter costume. We really wanted to create a hat from scratch, using only Cricut materials and the Maker. So I was super excited to find this 3D hat design, in the perfect shape I wanted to create, in Cricut Design space!!! I sized it for our hat, which ended up being approx. 7″ in diameter. 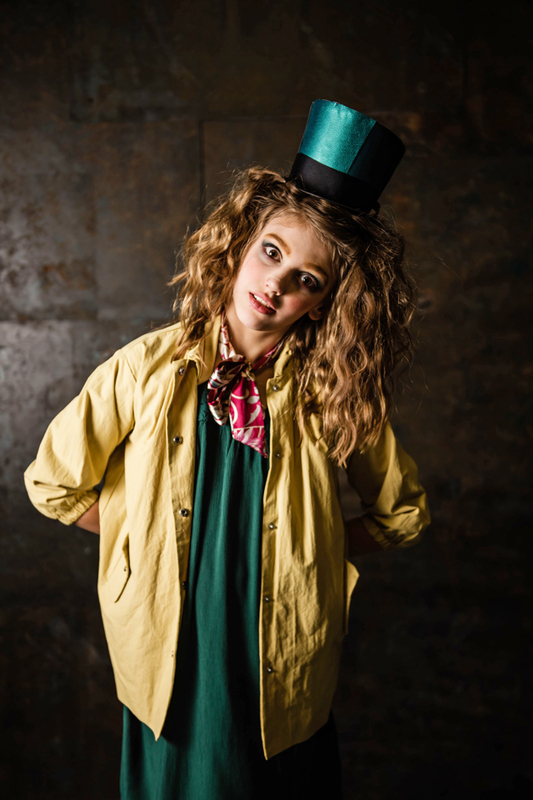 Click here to access our Mad Hatter design. 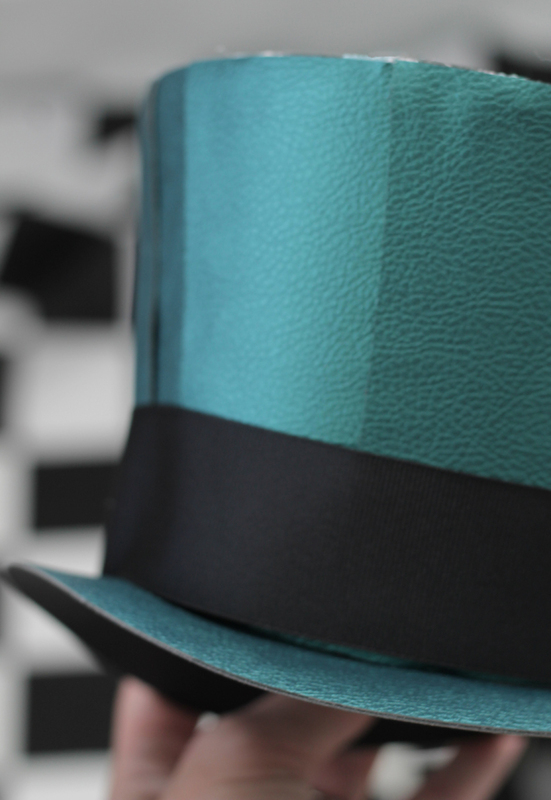 The next thing I was excited about was the material we chose to cut the hat out of… the pebble faux leather in Peacock! 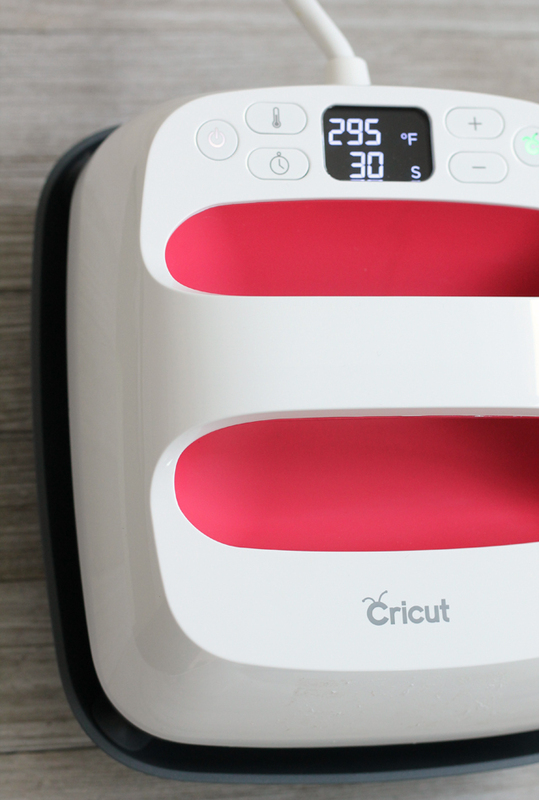 It is one of the most beautiful materials that Cricut carries. I fell in love with it as soon as I saw the color and texture! 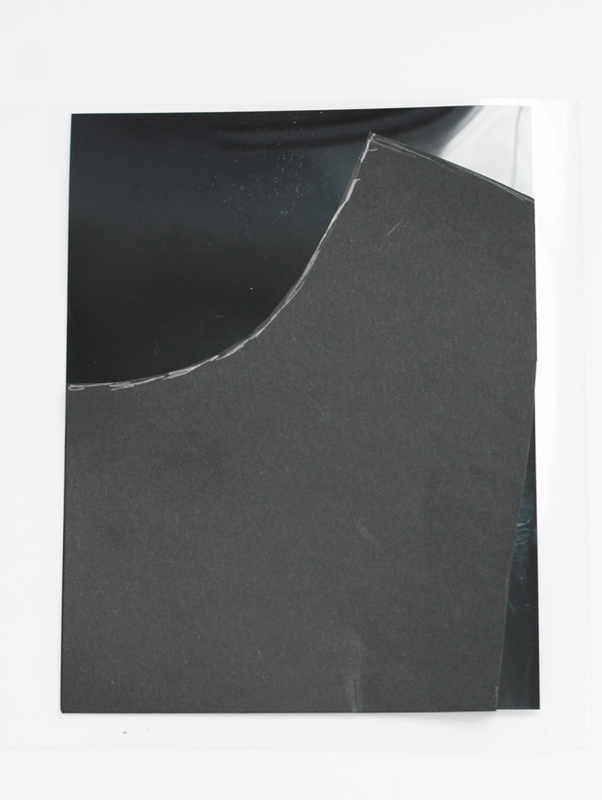 This faux leather comes in a 12″x24″ sheet, which is the perfect amount to cut out the hat design. It cut out so smoothly with the fine point blade! 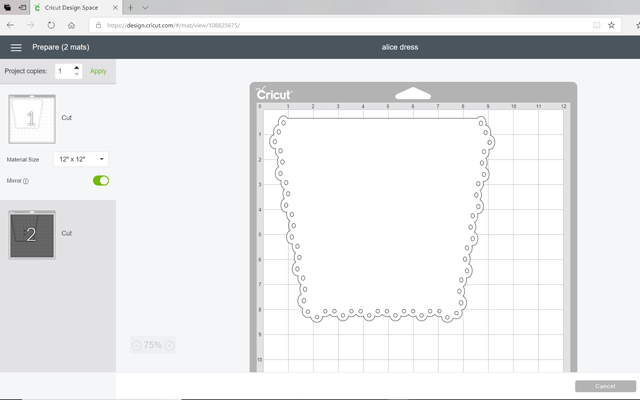 It may be my new favorite material to use with my Cricut Maker. Once I had all the pieces cut out, it went together pretty self-explanatory. There is a top, rim, and then 2 side sections that you glue together to create the shape of the hat. 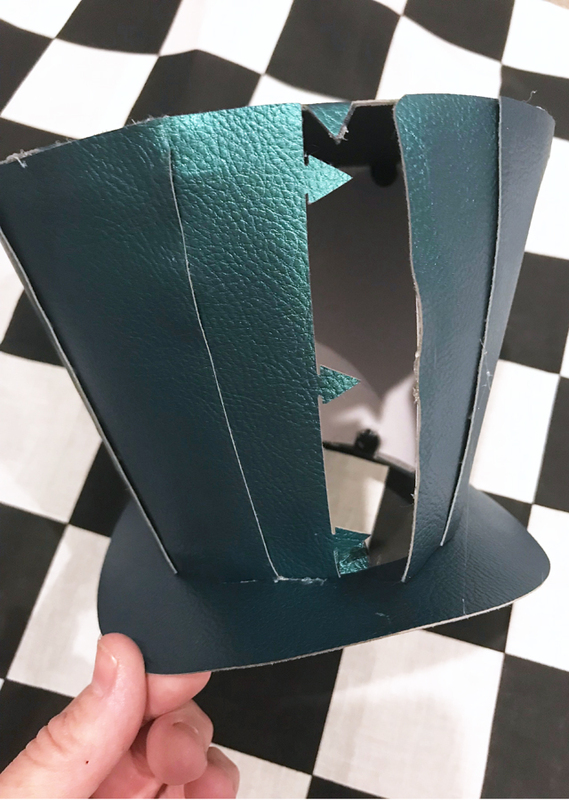 One tip I definitely recommend: cut another top and rim out of black Cricut kraftboard and glue them to the back sides of the leather pieces with a liquid glue (mod podge) before you assemble the hat. This gives more shape and sturdiness to the hat. I just cut another strip of leather to fill in the gaps on both sides and that completed the hat! Then I added some fat black grograin ribbon along the rim of the hat and tied a bow in the back. I can’t believe that I created a hat from a sheet of faux leather! It really makes the entire outfit come together! 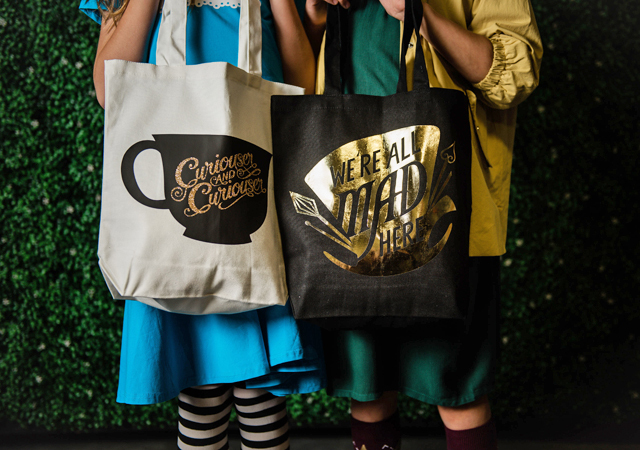 We also made some Alice in Wonderland trick or treat bags with the same cut files, and we will be sharing that tutorial soon!